On a cold day in December, the 19th to be exact, I literally ran through a parking lot at my full speed. As I ran, something shiny caught my eye and I stopped, for a brief second, to pick up the penny that lay heads up on the cement. David grabbed my hand and urged me along and I said "I just grabbed this penny, it was heads up and good luck." and I tucked it in to my pocket, gripping it tight. The door that we ran through was to the emergency room, and what lay behind those doors was my father - in a state that was a complete mystery to me. I had been on a frantic call with his husband a few minutes earlier, and we got in the car as fast we we could go. I was supposed to be at a concert in Tacoma, and David was supposed to be working but was sick. It was not just a coincidence that we were both home when I got that call, I'm sure of that. We drove the 5 minutes across town not having any clue what we would find. I speculated aloud, and David just squeezed my hand and told me to think positive thoughts. As we drove to the hospital, I couldn't stop thinking over and over again that this could be really, really bad. So it seemed only natural to grab on to any shred of hope and luck that I could possibly find as I ran in to the complete unknown. Less than one hour later, I found the penny in my pocket and angrily gave it to David, declaring "take this stupid thing, it was not even close to being good luck." Words had been said to us that even now I'm having a hard time typing... A strange person had walked in to the room that we were waiting in, on the edges of our seats, and told us "I'm sorry, he's gone." It was numbing, and I felt the walls and the reality come crashing down on me. And when I found the penny awhile later, I felt my anger flare up at the sight of it, and tossing it aside for letting me down was the obvious solution. Fast forward to two weeks later. Christmas and New Years had come and gone, and we had all gathered to say goodbye to my father. One of the hardest days of my life had gone by in a sort of blur, but I'd been surrounded by more love than I'd ever experienced. My family and best friends took such good care of me throughout those two weeks, making sure that I was safe, and comfortable, and reminding me just how loved I was. They let me cry when I needed to, helped me laugh when I needed to -- did everything perfectly. I could not have asked for more. After the dust had settled on my house and I was sitting down to write some cards, I felt reality and the quiet heavy on my shoulders. David was cleaning up, and he approached me at the table with something in his hand -- the penny. He told me that he knew that I was angry, and that the penny had not done what I had hoped, but that he was holding on to give back to me so I could have it. I took it from him, and sat holding it, reflecting on how much my life had changed in just under 3 weeks. I cried and cried and cried, which I'd come to realize was going to happen a lot (and had happened a lot already) and sat in the living room to think. It was then, looking at that penny, that I thought about my dad and his connections to this coin in my hand (besides the obvious that I've already mentioned). My mind drifted to a story that my dad had told me often... when he was young, he had a Cocker Spaniel named Penny. He adored Penny, and told us frequently growing up that Penny had saved his life once. He had gotten lost in the woods and it was Penny that got him home. The way that he spoke about Penny was always so tender and loving. I loved that story. One of my favorite things that I liked to tease my dad about throughout his life was about candy. He had told me once that the only thing that he had ever stolen was a piece of penny candy from a candy store near his house in California. He had said that he felt so guilty about it, and that if he could go back to that store and give them a penny, he would. I always teased him about that, joking that they closed down because of that one piece of candy. It was one of my favorite things to needle him about. Not to mention the fact that he went through a huge faze of decorating with copper. There are lots of copper decorations and whirly-gigs hanging in his house. He fell in love with them years ago and went through one of his phases, and ended up getting a bunch to put around the house. So as I sat there and cried thinking about what I had lost, and holding that "stupid penny" tight, I realized that things don't always present themselves for the obvious reasons. 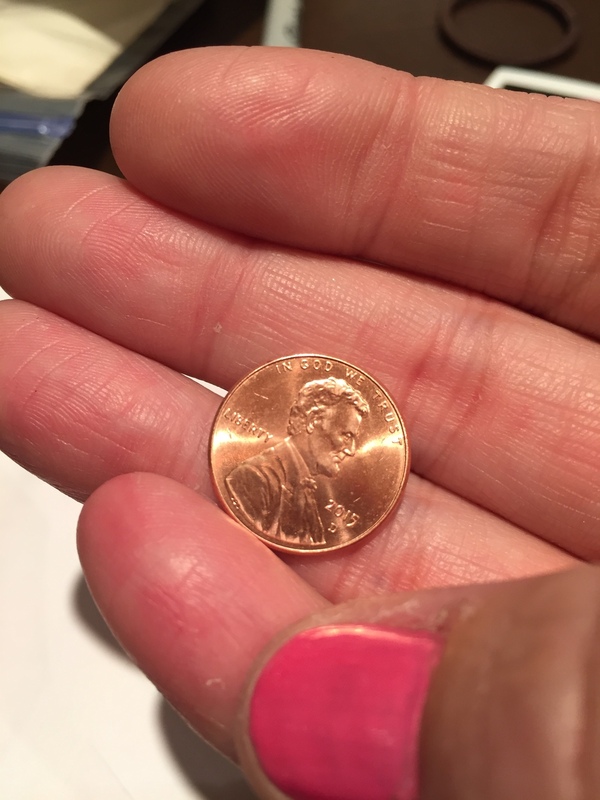 And that even though that penny did not bring me the luck that I thought it would, it reconnected me to parts of my dad that I hadn't thought about in a long time, and I'm sure will resurface many more times throughout my life. And it's these little memories that I'm so, so lucky to have gathered and held on to for when things get hard, and when I can't hold back the tears any longer. Memories like these will pull me through anything. I'm holding on tight to this and all of the memories that it brings.